I am woefully behind in posting sermons here- in part because I was fighting major sickness before and during Holy Week, and then there were the funerals both at the church and beyond. Normally I wouldn't bother to say any of this except to say- for all of us, sometimes there are clusters of busy-ness that we are trying to work through. And when we are busy, sometimes we don't get to pay attention as closely as we might tend to or want to. So in the midst of that I was heading into Sunday feeling like the car coasting on fumes. And wrestling with a sermon that wasn't quite clicking and I was looking for just that certain something to wrap up with and I found it! Or so I thought. I was preaching on 1 John and wrestling with the notion of Christian perfection and somehow I came across "When I Say I'm a Christian" and it clicked! And the poem by this name was attributed to Maya Angelou. I loved it, and I spoke of it in my sermon and several people were really taken by it. The dream for pastors is that people tell you how they connected with the sermon, or what they will be thinking about, or in this case, one person was taken by the poem and went out to find it. Only to discover that there was a whole lot more the to story- and as grateful as I am that he was listening to my sermon, I am even more grateful for what happened next. It seems that the Internet has co-opted "When I Say I am a Christian" and by that I mean that it has been adapted, and given different attribution and circulated in a variety of ways, BUT these things have all happened without the permission or desire of the true author. The true author is Carol Wimmer. Her website is HERE. Carol wrote her poem in 1988 and it was first published in 1992. She holds the copyright to her poem. So, perhaps now I should add that in addition to being a pastor, I am a lawyer and in fact have taught at Gettysburg Seminary and at the Region 7 Leadership Guild on the subject of copyright permissions. It is absolutely a question of Christian ethics concerning Luther's notion of vocation, not to mention the 10 Commandments has a thing or two or two to say. And of course the federal law has a lot to say about the rights of those who create. We want people to create beautiful music, art, poetry, photography, and resources that enhance our lives and ministry. And we want immediate access to the things we want to use. As much as I am a creature of social media and the internet, I was reminded yet again of the deceptive nature of what is "instantly available." This is not the same as instantly usable. Those who create have a legal right to compensation for use of their work, and a legal right to oppose the use or adaptation of their work in ways they do not wish to consent to. It is a matter of compensation and dignity. So often in our world of instant digital media, we fall into a trap of a combination of impatience and desire. Here I was a "late in time" sermon writer who now realized that what I thought was the truth was not. And of all things, in my own area. Ironically, the sermon I was preaching using I John 3 focused upon what it means to be God's children, not only in the great beyond but in this life. The challenge of living as the epistle says " that those in Christ will not sin." The struggle of the concept of Christian perfection and the sense of gratitude and humility we can sense when we remember God's love. We cannot achieve the vision of what it means to be pure or without sin. Yet over and again, the God who loves us and calls us children invites us to strive to draw closer. Our lives are lived somewhere between perfection and "who cares." " I want to" is not enough of a reason to run roughshod. Here are her words- "So many people have NO understanding of the purpose of copyright law. There is NO perception of the need to guard and protect the spiritual intent of a work! I literally receive hate mail from people who have had the copyright infringement removed from their social media accounts. I am accused of not being a Christian. Judged as being spiteful, or against sharing the gospel in order to make a name for myself. These judgments come only from those who carelessly share the altered version of the poem which changed the original intent of the work...It's all about protection of inspiration and intellect...In all my years I have never had anyone come to me with the desire to use my work in the context of discussion on copyright issues. This is wonderful!!!" Imagine, sisters and brothers, discovering not only that your words have been twisted, but that all kinds of merchandise appears with what is not quite right but also for which you receive NO compensation- coffee mugs, posters, calendars, and more. And to boot, the poem you felt inspired to pen is attributed to another person altogether! I hope you can hear her pain in the words above. This is the way many whose work is lifted feel. And well they should! While I am sorry I originally got it wrong, I am delighted to have connected with Carol and the rest of her website HERE. And I am grateful she provided me with a download of the original poem along with permission to use which appears below. Sisters and brothers, may we strive to do what is right, walk in grace and honor what others create. When my girls were babies I used to love to give them baths. To marvel at their fingers and toes- pink and beautiful. And babies love their feet. They enjoy looking at them as much as we do. They are a source of joy. Sometime after that though, I am not sure when, we stop thinking that. We learn to think of our feet as something to be covered up, not exposed. Something for which we need props. Even the bravest of us get pedicures. Feet are somehow not beautiful. And so when we hear that Jesus washed feet on the last night with the disciples, I wonder how many of us would be in the church today if the way we remembered Jesus each week was to wash feet? Yet here we are with this lesson, and every year for the past three I have preached on it. Maybe some day we’ll wash feet. But not tonight. We hear that Jesus gathered the disciples for a meal and for conversations and that he loved them to the end. And he is entirely in control. And slowly, he took of his robe and all the things that identified him as a Rabbi and a Teacher and a Leader. Set them aside. And there he is, wearing only a towel and holding a basin of water. And he begins, kneeling and crawling, from person to person and washing their feet. And it’s odd and uncomfortable. And we can’t imagine. It’s odd and uncomfortable. And yet Jesus knew where their feet had been. Those feet were dirty and calloused, perhaps scratched in places. Walking without the best footwear, and walking on the paths animals also trod. And animals do what they do- and the feet bear it- dirty, damaged and stinky feet. And he goes to person after person. And maybe deep down we even want to say, “Get up, Jesus!” We don’t want this. As beautiful as it is that tonight we are celebrating 6 kids making first holy communion, and it is beautiful, we want communion, and Easter! Not Holy Week and washing feet. Like Peter we want to say- no way! Yet Jesus loved them to the last. To the very last one. Even Judas had his feet washed. Be still. This is for you. Even though you don’t understand it. In humility and service, in love and intimacy, Jesus loved. Showing there was nothing that stood between us and God’s love. He loved who we are- people uncomfortable in our skin. the times the disciples said they would do something and then didn’t. The time feet walked to a meeting to agree to betray for 30 pieces of silver. As Jesus keeps showing intimate, no holds barred love. Knowing where the feet will go. Yet saying- you belong to me. And you belong to each other through me. And the message for us as ever is that we are exposed, but we are loved. It’s a gift we almost don’t want- we don’t want to be that known and exposed. And yet, it’s the gift we most desperately need- to be renewed and cleansed by real intimate love. A love that challenges everything in us and yet is whole hearted. This is what we long for, isn’t it? Isn’t this why we are here? God knows us- we are exposed. Yet loved. God loves the real us. It is uncomfortable, and sorrowful, and leaves us in humbled awe, and hopefully joy. This is the love we are then challenged and empowered to share. Love one another like this. This love- This is Christ for us, Christ with us. Perhaps I am just ready, beyond ready for spring. Today we hear Jesus say he must be lifted up, and to the ears of those listening they imagine he means “exalted.” Which is a word not often used in our everyday speech. But to be exalted reminds me of what we see when the winning pitcher or the MVP is lifted up and carried by teammates after the big victory. That image of baseball season seems to work well for most of us. Not just for the warm weather it imagines. Or maybe you’ve been into March Madness and the winning team hoists someone up to cut the net off the hoop. That’s the kind of lifted up people expect. In the gospel, the Greeks have come to see Jesus. They have come on the heels of Jesus having raised Lazarus from the dead. They are drawn by the curiosity and the power of that move. For the glory, or maybe they are like people perhaps who become fans when the winning streak is on. But as far as we know, they don’t see Jesus at all. Which is ironic since carved into some old pulpits is the phrase, " Sir, we wish to see Jesus." Instead, Jesus, hearing of their presence says that it indicates something else- God’s broader mission beyond the people of the covenant, and that for Jesus, his time is up. By the time the Greeks have caught the message, things must move quickly. And he says what probably confounded everyone- you want to see me now? Come see me when I am lifted up- that will draw everyone. But of course he’s not talking about the victory exaltation- he’s talking about a bloodied, naked body on a cross on Skull Hill. Why on earth would THAT draw people? I once knew a pastor who had a life sized cross and he would have it laid across a section of the pews each week during Lent. And people refused to sit anywhere near it. Avoided it at all costs. Finally someone came and told him that that cross wrecked the beauty of the sanctuary. Since the time of my installation, when we borrowed a processional cross from Christ Hazelton, I thought we should have a processional cross here. Frank and Barb Gaval have been working on a processional cross for this congregation. For us to use on special days like Palm Sunday, Easter and the like. But it’s not just a cross- it’s a crucifix. With Jesus lifted up. In the course of its preparation, Barb and I have talked about what a moving experience it has been and the challenge to get Jesus “right.” Some of that is about things like Jesus’ head being the right size or the draping of the arms, and proportion. But the deeper challenge has been things like deciding to make a crown of thorns, choosing the nails to nail Jesus to the cross. And the temptation to give Jesus a little more to wear than we know he was wearing. Can’t he wear a little more than one strip of cloth? This wrestling with seeing Christ lifted up – in the flesh points up our own wrestling with what it means to imagine God’s love in the flesh in a visible body, in an explicit and heartbreaking way. And the sacrifice. In death. Jesus followers expected a Messiah who would live forever, and the Greeks expected a victor. No one was looking for death and loss. Just as then, we abhor the notions of death and loss. Not just in imaging that death on the cross, but the concept of sacrifice. We prefer perhaps a different Jesus. And the question for us as it was for those Greeks and the disciples is I think, which Jesus draws us here? A vision of glory or that seed willing to die for the sake of bearing much fruit? Every believer and every pastor is tempted, you see- just like the temptation to give Jesus more clothes. Tempted to “realize the kingdom of God apart from the cross of Christ. We are tempted to win the world and draw people here with programs, agendas, food. And we excel at that those here. But perhaps maybe we think at the most basic level because the message of the cross seems by itself, ineffective, counterintuitive, even foolish.” Leading with the cross may not seem like the best idea. People want beautiful and dynamic congregations. And after all, if people see how well we care for ourselves, they will want to be a part. People want winners. And we are dynamic and vibrant. Yet sometimes I have heard already, we are so good at it. That we communicate that we have it all figured out- and if you do not, maybe there is no place for you. Or that all our programs already so well run, that maybe there is no place for you and your energy. All of our efforts and ideas, while not entirely bad also have the potential to draw us away from God’s simple truth- it’s not the congregation that draws people into the kingdom, but the Son of Man lifted up. For all. Yes, we participate in programs and initiatives, and we derive immense pleasure from relationships and events. But at the heart of the reason and the center and the mission is always- God’s Son lifted up for us. This is the game changing love and light for our lives and the promise for all. At a certain level we communicate that every day when the lights come on at night. I am not sure how many of you have looked at it lately- we have a profoundly beautiful stained glass window. When I first came, I was not sure what the breathtakingly beautiful stained glass window with all its color and movement was depicting. Frankly, I thought it was depicting the beginning of creation. Perhaps that means I watch too much Big Bang theory. It was only in the daylight that I saw the crown of thorns on the outside. Then a visitor asked me about the window, and I confess I didn’t know. So I asked to know more. 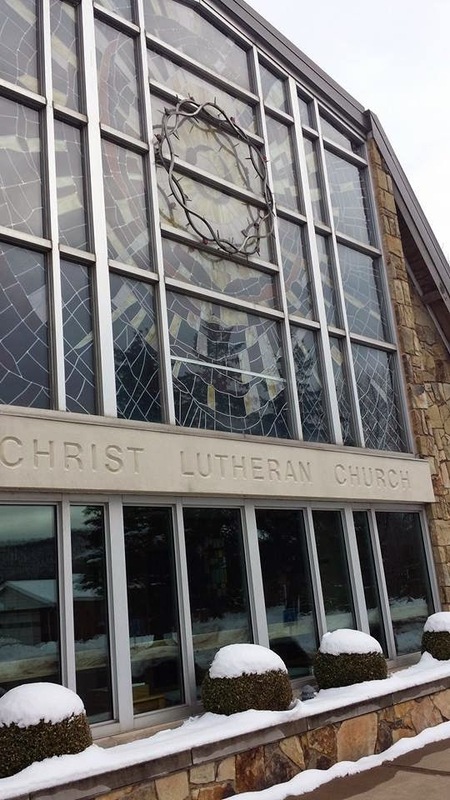 And learned that the window depicts Christ on the cross, looking down at his head wearing the crown of thorns. And the love and power and new creation that radiates from him. It’s not only breathtaking, it lights this part of the Valley. It shows us the breathtaking beauty of God’s love for the world that we are invited to share. It shows us the heart of God willing to risk it all and it points ever outward. Love and sacrifice. 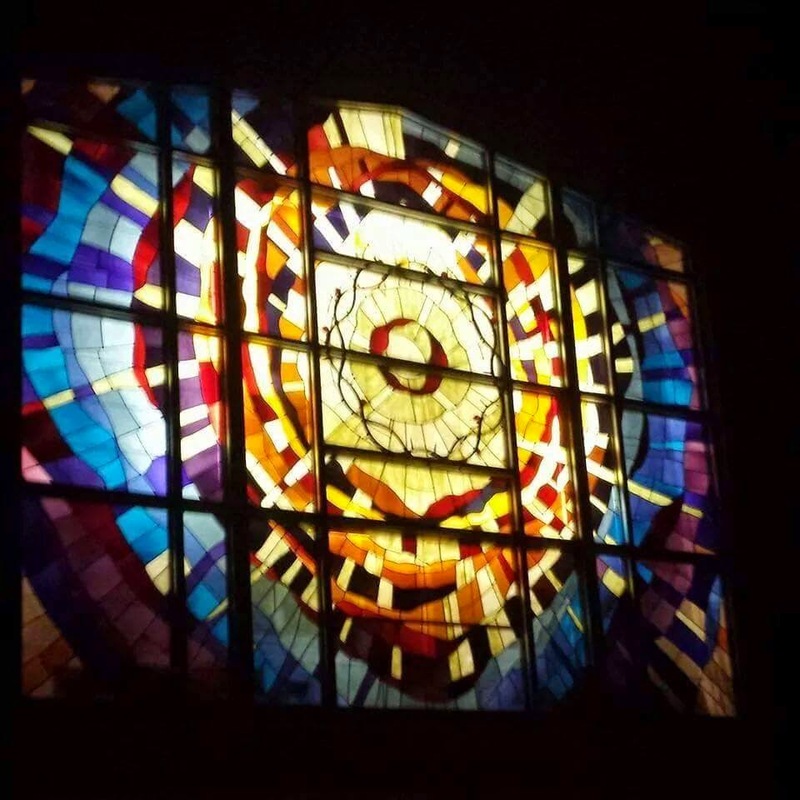 There is blessing and challenge in this- If God’s mission is ever outward, like the light of our stained glass window showing the vibrance emanating from that crown of thorns, are we ever outwardly turned? Do we know the needs of the Greeks in our midst, those unchurched? Those who gave up on church? Those who long for a message of good news? Do we know how to find them and meet them with the gospel? And re we ready to let our seeds die for the answer? If they come, are we who love life here prepared to lose it to draw others closer in the kingdom of the cross, even in something as simple as sharing “our seat”? The good news is that we are saved by the Son of Man lifted up. Not left to try to earn God’s love. Whether we do well or fall short. And we are saved from the belief we have to be perfectly dynamic- Christ on the cross, revealing God’s love is sufficient. It is sufficient for our life and sufficiently good news to share. We are called first simply to believe in this grace and power and live life in faith- that the one whose desire is to draw all into the kingdom will lead ever into the future. And then, we are called to believe that the God whose desire is always to draw all- empowers us to help others see Jesus. Let’s not let the Greeks be the example- let’s not let people fail to see Jesus. We are approaching Holy Week- may it be a time when we invite. And maybe, let’s dare to let go of what we might be holding onto that becomes an obstacle, but believe God will bring forth fruit for us all. So look at the cross, and may we be ever drawn deeper into the heart of our Lord and life for all. Whenever our daughters fought when they were younger, there was a lot of stair stomping and door slamming. and they would fight with one another about who had the right idea, invariably, someone would stomp off with one yelling, “I’m leaving!” And the other yelling back some variation of “GO ahead! See if I care!” When I read the passage of Moses and the people in the Book of Numbers, and all of the whining and grousing of the people about the food and the water and oy! I wonder if it doesn’t go through God’s mind to just say- “Go ahead, you stiff necked people, see if I care!” And it is disturbing to imagine that God would subject them to the poisonous snakes. Although in another sense, perhaps God who has been watching over them in all their kvetching while helping them overcome obstacles may in fact just be deciding to stop holding back the snakes. Because normally those snakes would have been around. And maybe until now they have been kept at bay, but now, they are set loose. In the anger and hurt and sense of betrayal. and maybe just like perhaps we have as parents sometimes decided, let the rebellious experience what they seem determined to experience. When Moses comes to God in prayer for the people it may even feel like a pointless prayer, as he too has been the subject of their complaining. But he prays. God still responds and tells Moses how the people can be healed and live. They are reminded what got them there to that troubled place, and what there is no place for. But the last word is what God has overcome for them. The last word is love. When I worked as a chaplain I was paged to a modern day situation like that. A mother was in her daughter’s room in ICU, grief stricken and angry. The daughter who hadn’t been in good health for a variety of lifestyle reasons had come to live with her Mom who wanted to take care of her and help her. But because doing so often involved a clash of choices, it was often confrontational. And on a particular day, the daughter, whose whining had reached epic levels and the mother who frustration matched it, had a shouting match which ended as the daughter pronounced she was leaving and the mother shouting at her- Go ahead! And knowing that her daughter was really sick, she also said words she probably meant to keep in her head, but they came out anyway followed it up with- You can die for all I care! Words borne as much out of grief as prediction, because the daughter seemed determined to buck all efforts to live. Well, on a hot day, this sickly, overweight daughter, blood pressure soaring, stomped off down the street, on a hot, humid summer afternoon in the city. And it was only a matter of time before she collapsed from a combination of the heat, diabetes and toxins. She ended up in the hospital, potentially not expected to live. Near death at the hands of the modern day serpents in her life. Proof that God who gives us freedom will let us have all of the hell and poison we want if we are determined to have it. There we were. The mother had called for a chaplain, barely able to contain her emotions. Wanting healing for her daughter, she was also wracked with sadness at having the possibility of the last words her daughter heard her say be those poisonous words. That the last moments were hearts cracked and broken and toxic. I asked her what she would say to her daughter if she could, and it wasn’t - boy did you screw up! It was- I want to tell her that I love her and I want her to live. And in that moment, the mother glimpsed the heart of God. The heart of a God who wants us to be healed and saved. This is the love we hear of in the Gospel- that even in the midst of colossal mistakes and heartaches and sin, God sends Jesus because God loves us and wants us to live. And then it is easy to imagine God whose ultimate purpose is to condemn and to punish. Because somewhere in our hearts there is a crack, there is a poison and brokenness that needs to be healed. Healing began for the mother in the hospital even as her daughter was being healed. There would be more words between them. She let go of the toxic and those cracks in her heart began to mend as we prayed- and she joined in by telling God she didn’t know who the lady was that came to the room, but she knew what God wanted her to see, what mattered and to be forgiven. To know that even though the journey would still be hard, more than anything she wanted her daughter to wake up so she could say “I love you.” As the days passed and the daughter improved, I prayed it was hopefully the start of a new story for them. “When we crave the light, are drawn to the truth, and are desperate for grace, God gives” us what God’s heart longs to share-that Jesus was sent not to condemn but to save. Lifted up on a cross to show us both the depths of our sin uncontained and God’s victory over all that robs us of life. So we can live a new story. God’s love in the cross creates a new relationship of uncontainable things- love, and joy and grace. In those moments when we experience it, truly, we can’t help but share it. Jesus invites us into the heart of God and a new promise. An ongoing story of new creation and healing and transforming our hearts to be closer to God’s. This is who God is, what Christ shows and accomplishes for all. And God’s love for us is why “God continues to come, year after year, to person after person…to show us an expansive and indestructible love that’s been ours all along- every single one of us.” Even the ones we’d just as soon say “see if I care!” to. Jesus is endlessly inviting us to trust, accept, believe, embrace and experience it again and again. God comes to save- whenever we believe that, it changes everything- how we see ourselves, how we see others, and how we see God. So again this day we look at the cross, picture Christ and the new life we are given. And then keep believing that a love “as wide as the sky and as small as the cracks in our hearts we think no one knows we have” is God’s love for the whole world. For the third week in Lent, I have been focusing upon the covenants of the Old Testament with the childrens’ message. So far, we have explored Noah, and Abraham, and now this week Moses. God used Moses to lead the people out of slavery in Egypt to freedom and God gave the 10 Commandments to Moses for the people. Because if you have been a slave with no ability to make choices and now you have freedom, what should that look like? I shared a few “commandments” of my own- “ You are your own boss. Do whatever you want, whenever you want to” and “Parents just don’t get it- ignore them when you want to” “ the one with the most toys wins” and “lies are OK if they keep you out of trouble.” The kids wisely knew those were not right. God wants us and everyone to have life that is good. God’s words for us help us remember how to treat others and how to be connected to God. Then I shared a few more “commandments” with the rest of the congregation. You can find these commandments in books, or in popular culture, maybe even embroidered on a pillow. And they point up how at odds being God’s people really is. The 10 Commandments are at odds with life as we know it. It is, as Paul writes to the Corinthians, foolishness. Add to that our perception of “the Law” as the commandments can be called. Our views of the legal system and regulations, perhaps on our mind here in tax season. And of course we have opinions about lawyers. All of those things can get added into how we hear “the Law.” Like it’s a hammer. We chafe against it. It can be hard to remember that these are actually God’s 10 words- that’s the Hebrew. God’s 10 Words for Life. Given out of love by a God who has saved the people, “I am the Lord your God who brought you out of Egypt, out of slavery” and literally in Exodus 19, God says- I bore you up on eagle’s wings. It’s a mothering image. A loving image of a God who saves people and makes promises and provides for life. All of the covenants in some way embrace this. From Noah, being told never again will creation be destroyed, to Abraham being promised he will be the Father of generations. Look at the stars in the sky- more numerous shall your descendants be. To Moses- I have freed you and I want you to be able to handle freedom. That’s what the 10 words are about. Life for all. Given by a God who we hear in Psalm 19 has created an arrangement for all of creation- setting those stars in the sky. Creating life for all- beauty and diversity and abundance. For each of us and all of us. We are connected. In one connected relationship with God and all of creation. And it then can seem for a moment, so simple. The 10 Commandments are not long. But it gets complicated by all our layers of regulations and understandings. Our limits and rules. And Jesus shows up in the temple where people are bogged down in all those layers of barriers and limits and separation. Where what had been well meaning had gotten lost. In the system of the temple, the people brought sacrifices- if you came to seek forgiveness, you brought a sacrifice; if you came to give thanks, you brought a sacrifice. The sacrifice system was intended to tend a relationship. And so it would seem that selling animals people needed would make sense. Except that the focus had become so much about the business of the selling, the real focus got lost. And Jesus started flipping tables and clearing out those layers. So what does that say to us today? After all, we don’t have a temple or a sacrifice system. The sacrifice has been made in that cross for us. For one, a reminder that we are not earning something. One of our confirmands asked whether the 10 Commandments were really just a reward system. And people believe that. God’s 10 words for us are not about earning something. We don’t earn our salvation- that same cross made on our foreheads in baptism shows us God’s words for our life. Christ is the promise and decision for us for life already. God’s love and grace are already assured. We can live in that freedom. We can remember that we too are not perfect in our living- but have been given God’s promise and forgiveness. In this season of Lent when we consider what it means to walk more closely with God, we can ask what in our lives needs to be cleared out that is creating barriers, or separation or is not centered in proclaiming Christ? I have no agenda when I say this for us personally or as the church. I’m too new to even guess. It’s just a question, but it is the question. What is our focus? Why do we do what we do? What might need clearing? Where we find our lives are centered in proclaiming Christ, may we give praise. Where they are not may we turn again to the God who claims us, forgives us and loves us enough to give us words for life. So today, all of our lessons are about challenging what we think is possible. Surely the covenant God was making with Abraham seemed impossible. After all, if I ask the man who today we acknowledged for celebrating a 90th birthday what he would think if tonight he was told he’s fathering a child, we can see his laugh and head shake “no!” God told Abraham this but then time passed before the conversation we see today and it had be even more improbable. How astounding to have God already have told you that your descendants will be more numerous than the stars in the night sky. The verses we skip today would tell us not only that Abraham fell face down at this, but he laughed. He and Sarah laughed! Now God comes to make this covenant- a promise to be fulfilled. And many of us know that a baby at any age brings a whole new life- both joyous and sometimes frightening. But here in this covenant with Abraham we see a whole new identity, and a new name ( father of nations) and something sacred- that life together with God is much more connected- God is not distant, but one with the people. It challenges what seems possible. And even though it seemed to be impossible, there was life beyond imagining. As we look at the apostle Paul, and his writings, we see one who was a persecutor of Christians, who handed over, and imprisoned and oversaw the death of others. Until that dramatic conversion on the road to Damascus where his whole life changed. But at first Paul thought he knew what his mission was- to speak to his people, to the Jewish people, after all he had been one of them. But they rejected him. And he seemed stuck, but instead he learned that his true ministry was to proclaim the gospel to a whole other group of people- the Gentiles. People he thought beyond God’s plan for salvation. But with a new name, and a new identity his message began the work of the church still today- making people one. It challenges what seems possible. And even though it seemed like an impossible thing, there was ministry beyond limitations. Today we hear Jesus has been astounding flocks of people with teaching, and healings and feeding thousands of people from what seems like nothing. And the disciples are amazed and in response to his question of “who do you say I am?” Peter has blurted out ahead of the pack- you are the Messiah! And it seems like this will usher in the age of power and glory and political might. And yet it here that Jesus responds in a way that shocked them- I will be killed and I will die and yet rise. No! Death cannot be possible! It cannot be the way this goes! It challenges what seems possible. And though it seemed impossible, there was life and salvation beyond belief. And yet, there it is in all the lessons really- that in order for God’s possibility to be brought forth, there is a death. A death to what we are sure we know, when God’s plan seems backwards. If we use the lens of power and possibility we will fail to grasp it- we will fail to get there. Because God is challenging what is “possible” and it is radically different- life altering. And rooted in love. A radically different love that looks at people no one is looking at, and goes places no one is thinking about and dares the impossible- Life for all. Then there is a second picture where the circles of work and play and rest are interconnected like a Venn diagram (you now know the extent of my math knowledge)- but there in the middle of the connection is that cross. And the caption says “one life.” Not two lives. One. God in the midst of it, creating it and active in it. God in it all, not just the official churchy part. And us in God’s world living out God’s vision. Here’s where the stars come in. They represent what is possible in God’s eyes. Beyond our imagining for ourselves and our world. Perhaps it seems like we are sacrificing to live a “one life” existence as opposed to just compartmentalizing God. And yet there is such blessing amidst yes, challenge, in one life. Imagine the possibilities for life, ministry and mission. Imaging the scope of God’s love. Perhaps our Lenten challenge is challenging what we think is possible. And then taking steps closer to living One Life with the God who is inviting us into what is possible- that everything we are and do really are one life in Christ. When you look at that star, may you be reminded of God’s calling.